The Pitch! is a laugh-a-minute party game that everyone will enjoy. Become a TV Executive competing to get your shows onto the air. Combine Character, Premise, and Twist cards into broadcast classics like Swapping Pants amd Pokechu Bites Again! The players whose shows get the most laughs will walk away with MILLIONS of soft-earned dollars. Have you ever said to yourself, "Geeze, I could make a better TV Show than the stuff that's on the tube!" Then here's your chance to prove it! 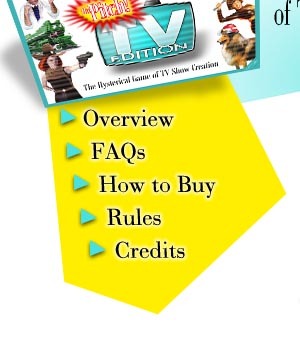 The Pitch: TV Edition contains everything you need to play. 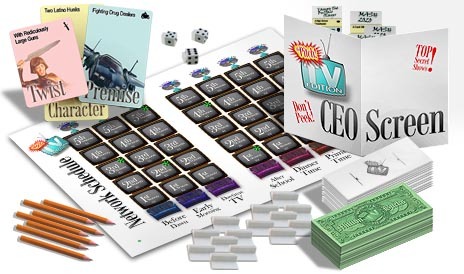 The rules are just a couple of pages long, and people of all ages love the way it combines humor and creativity for totally unique kind of gameplay. Million of dollars in cold, hard (fake) cash!